My Kitty: The Collection was a month-long project of designing and testing. This huge pattern will allow you to make no less than 8 kinds of cats with the option of longhair or shorthair on any of them. In addition, there are multiple options for tails and ears as well as color suggestion charts, a cat-term glossary, and much much more. This is a fully comprehensive pattern with photo-instructions for everything beyond your very basic crocheting. This pattern is written and arranged to where even a novice crocheter can tackle these kitty blankies with no problem. If you are an intermediate+ crocheter who wishes for a little less cat, you can purchase one of the 5 excerpts from this pattern found HERE. Purchasing the entire collection, however, is equivalent to about a 40% savings. Please note that yardage will vary by several yards between shorthair and longhair versions. 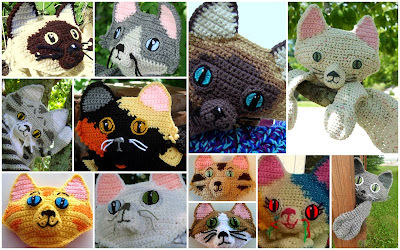 Some leeway is given for cats that you may choose more or less markings than another crocheter, but it is probably a good idea to have plenty of the accent colors on hand.